Prime Minister David Cameron has thanked the crew of HMS Illustrious for giving up their Christmas at home to help the people of the Philippines as the Royal Navy helicopter carrier returned to its home port. 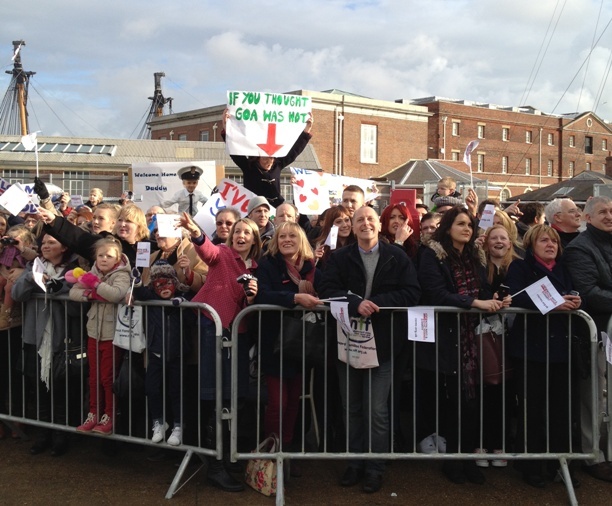 The 550-strong crew disembarked to cheers from their loved ones waiting on the jetty at Portsmouth Naval Base. 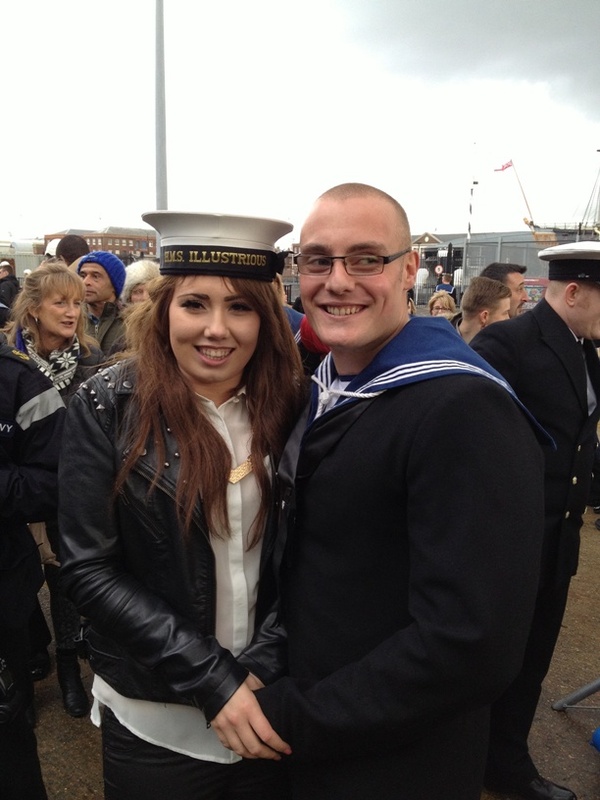 Among those returning were Leading Engineering Technician (LET) Jack Lowe, from Stoke-on-Trent, who had to postpone proposing to his girlfriend because of the warship's delayed return to the UK. 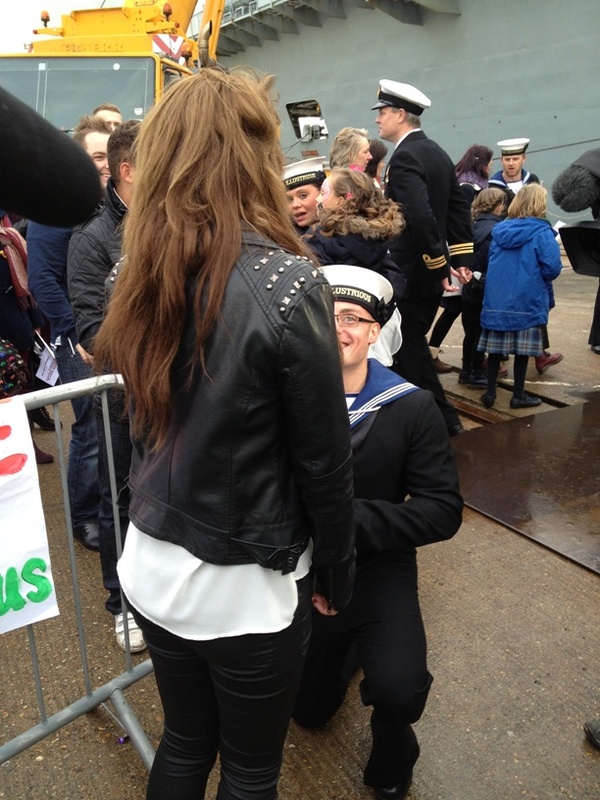 The 20-year-old got down on one knee to pop the question to Amy Clarke, also 20, from Portsmouth, who said yes with tears of joy in her eyes. LET Lowe said: "I wanted to ask Amy before Christmas; I had planned to take her to Paris, so I was gutted when I couldn't. Miss Clarke said: "It's absolutely amazing, of course I said yes. The 23,000-tonne ship had been due to return to base before Christmas, but while it was operating in the Gulf it was diverted to the Philippines to relieve Type 45 destroyer HMS Daring, which was among the first ships on scene to offer aid. 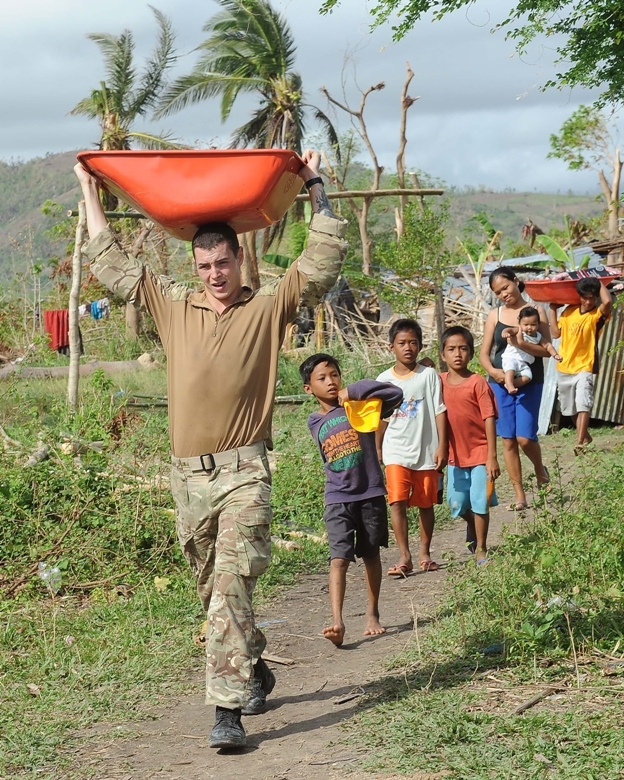 As part of the UK Government's response to the aftermath of Typhoon Haiyan, Illustrious and its crew, which at its peak was 950-strong, spent three weeks delivering emergency aid supplies and repairing key services and broken infrastructure. The first person to disembark at Portsmouth was the commanding officer, Captain Mike Utley, from Cardiff, South Wales, who was met by his wife Charlotte, and his five daughters, Harriet, 14, Isabelle, 12, Emily, eight, Beatrice, seven, and Imogen, four. 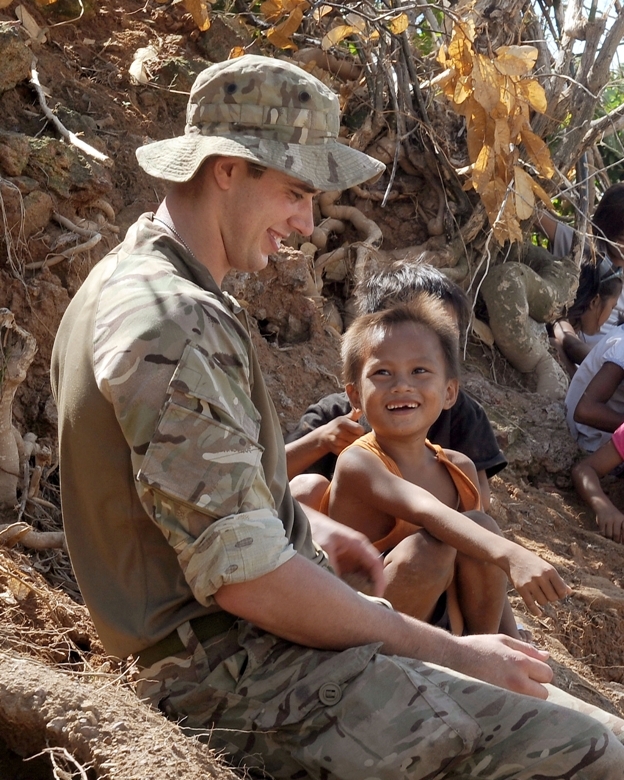 He said: "Our capabilities perfectly matched what was required in the Philippines. "We were able to get to where we were needed quickly and our size and flexibility meant that we could store and distribute extremely large volumes of emergency aid supplies. "Our embarked helicopters were essential in surveying large areas including remote islands and then in delivering aid to places that simply could not be accessed by any other means. He added: "The people in the Philippines are extremely resilient, but it was clear to me that those in the worst-hit areas had been through a lot. "Given the volume and type of aid and assistance that we were able to deliver to the more inaccessible islands, we believe that we set in excess of 40,000 people firmly on the road to recovery. "I am extremely proud of my ship and everyone embarked in HMS Illustrious for what they have achieved. A letter of thanks was presented to the crew after the ship's arrival by members of a local Filipino association. Able Seaman Emma Whitty joined the ship just two days before it left Portsmouth for her first deployment since joining the Navy 14 months ago. The 22-year-old from Fareham, Hampshire, said: "We are all really pleased to be home. "Being away for Christmas and the New Year was tough on our families. Both of my parents were in the Royal Navy though and they understand. "The support they gave me was tremendous. Illustrious, which sailed from Portsmouth in August for a major training exercise, was deployed for a total of 152 days, 128 of those at sea, and it visited 10 countries. The deployment included exercises in the Mediterranean and Gulf and counter-piracy operations around the Horn of Africa. 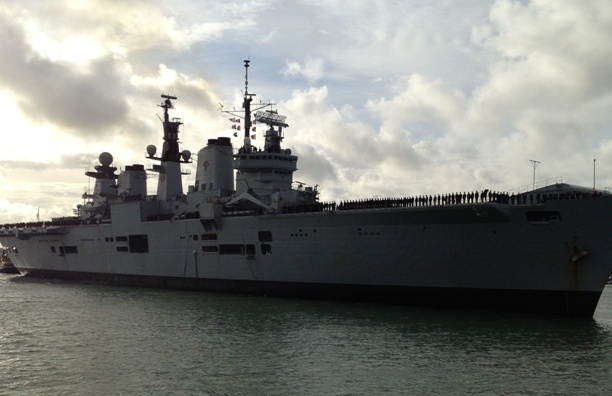 Illustrious will undergo essential maintenance in Portsmouth before deploying again later in the year.